There are so many reasons why a person might consider purchasing a karaoke microphone for their home or business. You might be thinking that it sounds a bit odd to buy a karaoke microphone for a business, but when you consider all of the possibilities for using one, it becomes hard to argue about their usefulness. Imagine that you have a small business and you are trying to project your voice in a large parking lot for people to hear about specials or other important announcements, wouldn’t it be much easier to be heard with a karaoke microphone with a built-in speaker? This is just one example of how a karaoke microphone could simplify your life, or turn up the fun on karaoke night, of course! Stick with us, and we will show you some of the best karaoke microphones on the market as well as give you a few tips on how to choose the best one for you. One of the great things about karaoke microphones is that you can use a lot of them in multiple ways. For example, the BONAOK wireless Bluetooth microphone can be used as an LED light show, a Bluetooth speaker, a microphone, or a voice recorder. There are plenty of options of change up your vocals and the sound of your voice or performance as well. Right on the housing on the microphone are a few buttons you can use to reduce the sound of an echo, adjust volume controls, and more! 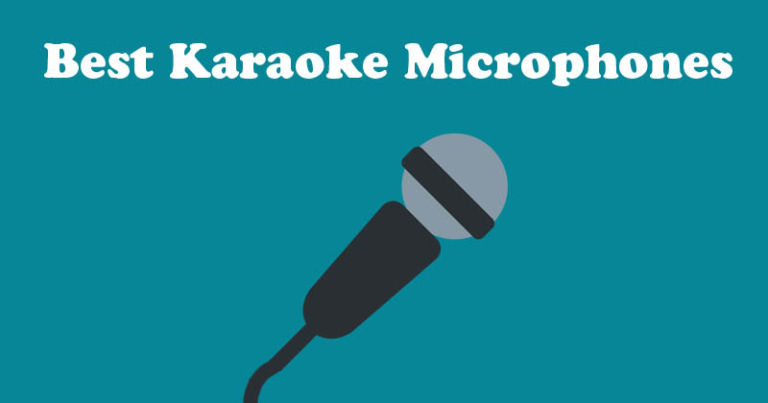 The KaraoKing is one of the few microphones out there that comes with a case, so if you are traveling from one place to another, you don’t have to worry about misplacing or damaging your microphone in the process. There is also a dock for your phone built right into the microphone, so you don’t have to hold your phone and the mic while you are trying to belt out your favorite karaoke hits. The built-in 5-watt speaker on the microphone pushes out an incredible sound, and the superior noise-reduction system makes sure your voice always rings out loud and clear. Unlike the first BONAOK microphone on our list, the upgraded version enables the singer to sync up their microphone to one other for duet performances. This would also come in handy if you are hosting an event for your company, one person could be DJing, while others come up to use the second microphone for speeches and more. The upgraded BONAOK microphone comes with a 30-day no questions asked money back policy and a 1-year warranty. If you ever have problems with the usage of your microphone or the system, just call the available 24-hour customer service line for assistance. The Fifine UHF wireless microphone system comes with an impressive dual channel receiver which can also accommodate a third, wired, microphone. If you have a large venue, or just hate being stuck within inches of a receiver because of a weak microphone, then you will love the 80-foot range of freedom you get when using the 2 wireless microphones that come with this set. Although this is one of the only microphones on our list that does not offer Bluetooth connectivity, it does give you a whopping 10-foot cord in which to move around with. You’ll want an Apple or Android TV if you are going to use the Singing Machines SMM-205 microphone, or at the very least be sure you have a compatible karaoke machine to plug the device into. One of the great things about having a wired microphone is that you never have to worry about charging it or replacing dead batteries. You can also use a single microphone to sing duets as the sound system in the mic is unidirectional. You can either choose to sync up your Bluetooth enabled devices to the Mosotech Bluetooth karaoke mic, or plug it directly into a computer or karaoke machine with the included auxiliary cords. The sound filter beneath the metal meshing of the microphone offers superior sound quality, as it works to eliminate popping sounds and feedback from the area. 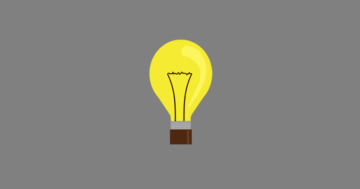 You’ll get a total of 4 hours to use the Mosotech on a full charge, but an LED indicator will give you a 20-minute heads up before you are disconnected. The Tonor Dynamic karaoke microphone is another that boasts a superior noise reduction filtering system. If you are tired of hearing a lot of feedback, whining, or popping as you use your current mic, then switch up to the Tonor dynamic mic to get the best quality sound for your performance. The sturdy hardware and housing of the microphone ensure that it will last you a long while and will hold up in even the harshest of environments. This is the perfect microphone for outdoor events or large corporate parties where you need your voice to be heard. The NASUM mic system gives you two handheld microphones to use, and a receiver which offers 2 antennas for seamless connectivity. You’ll never have to worry about feedback with this system either as the enclosed sponge filter reduces the sound of feedback tremendously. There are times when you may want to purchase a microphone system, but you don’t want to have to search for compatible units to plug into the receiver. Luckily, when you purchase the Cobble Pro karaoke set, you are getting 2 wireless karaoke microphones instead of only one. There is a special button on each unit that will let you remove the vocal on any track you use. However, make sure that the sound quality is as clear as possible for the best results. This is an excellent option for families as it gives you plenty of fun options that the kids will love. Not only do you get a colorful LED light show that syncs with the songs you are singing, but you’ll also enjoy the 4 voice changing effects that alter the sound of the singer’s voice. The microphone also has a built-in 5-watt speaker, so you don’t have to worry about having a separate sound system to have a good time! There are a few things you’ll want to consider before making your final decision on karaoke microphones. This might seem like an odd question, but not every karaoke microphone is solely created for karaoke alone. If you need a system to get your voice heard loud and clear over a crowd, the right karaoke system just might do the trick. Another simple question, but if you have more performers or speakers on stage at a time, then you might consider purchasing one of the options that give you multiple microphones to use instead of one. There are also units which allow you to plug in more microphones as well so this could be another viable option. One of the most significant features you’ll want to look for when searching for a good karaoke microphone is a noise reduction sound system. Most karaoke microphones will offer some sort of filtration system, but you want to make sure that you are purchasing one that will cut out all of the feedback and noise pollution in the area, especially if you are buying a microphone for professional purposes. The last thing you want to do is purchase a microphone nobody can hear you on! 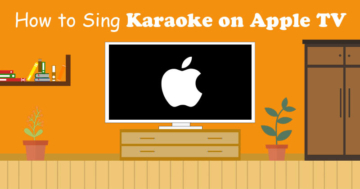 If you have an Apple TV and also love to host karaoke parties, then you must check out these methods to use your Apple TV as a karaoke system! 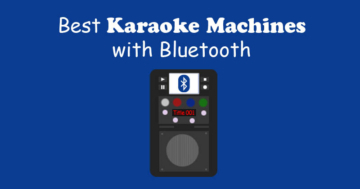 Karaoke Machines with Bluetooth are super useful since you can use the Bluetooth to play songs from phones, tablets and laptops on that Karaoke Machine. Nowadays, karaoke is very popular around the globe, but who invented karaoke, karaoke machines and the whole karaoke culture? We are a participant in the Amazon Services LLC Associates Program, an affiliate advertising program designed to provide a means for us to earn fees by linking to Amazon.com and affiliated sites. More information.